Home > With the latest hike in the US Fed funds benchmark, we are now in territory not seen in decades. Can low NZ rates be sustained in the face of these changes? 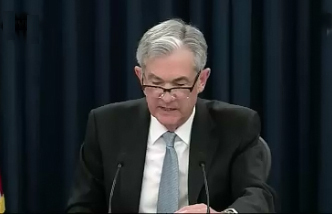 The raising by the US Federal Reserve of their Federal Funds rate by +25 bps to 1.75% today (Thursday) is notable for a number of reasons. Firstly, that is their highest official rate in 117 months, since October 23, 2008. 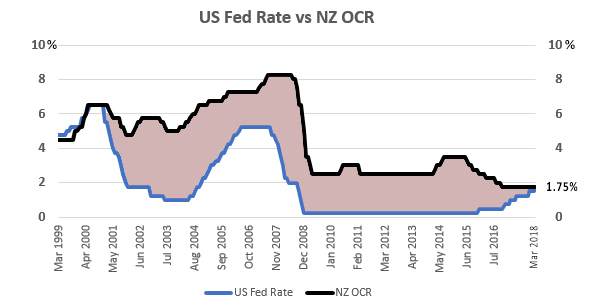 Secondly, it is the first time since December 2000 that the NZ Official Cash rate or its equivalent has been the same as the benchmark American rate. From here out, it is very likely that the New Zealand official rate will be less than the American rate. It is not clear how long that can be sustained, although the current expectation by economists is that it may last some considerable time. The American central bank has indicated that there will be at least two and probably three more +25 bps hikes in 2018 and more after that. That means that the US benchmark could be 2.50% by the end of the year. Most local economists think the NZ OCR will stay where it is through all of 2018. In that senario, we will have the largest discount to the US, ever. But more than the official rates are shifting. Given some of these relationships are now at 25 year extremes, it is an open question how sustainable New Zealand yields can stay at discounts to the American levels. Some eurozone economies have achieved that (Germany, for instance), but New Zealand and Australia are not Germany. Market forces may be unfriendly if they perceive these new relationships can't be justified. New RBNZ governor Orr will need to be very wary of unintended consequences.